Updated Monday, Dec. 19, 2016, 1:30 p.m. EST: The 3-year-old who was fatally shot in a car during a road rage incident over the weekend has been identified as Acen King, according to THV11. Little Acen was shot while riding in his grandmother’s car Saturday night. Neither the grandmother, identified as Kim King-Macon, nor Acen's 1-year-old sibling was harmed in the shooting. 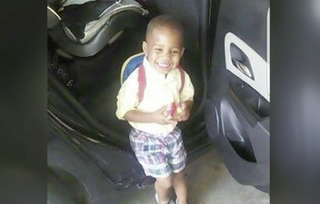 Little Rock, Ark., police have launched a manhunt for a motorist they say fatally shot a 3-year-old boy in a road rage incident over the weekend. ABC News reports that police are offering a $20,000 reward for information leading to the arrest and conviction of the driver in the Saturday-evening attack. According to the Little Rock Police Department, the boy's grandmother was taking the child and his sibling, an infant, on a shopping trip. The grandmother stopped in her vehicle at an intersection in Little Rock when the suspect pulled up behind the woman's car and started honking his horn. The grandmother honked back, and that was when the suspect stepped out of his black Chevy Impala and fired his weapon, according to Police Lt. Steven McClanahan. The boy was rushed to the hospital after his grandmother noticed he was wounded, but he did not survive. "Tonight's homicide was a road rage incident," police tweeted, saying that "the grandma and three-year-old victim are innocent and have no relationship [with] the suspect." The Washington Post notes that the 3-year-old is the second toddler to be killed in Little Rock in less than a month. Just before Thanksgiving, a 2-year-old girl was fatally shot when someone in a car drove by and fired into the vehicle she was in. That suspect has not been caught. Read more at ABC News and the Washington Post.